Big Data in medical science – what exactly is that? What are the potentials for healthcare management? Where is Big Data at the moment? Which risk factors need to be kept in mind? What is hype and what is real potential? 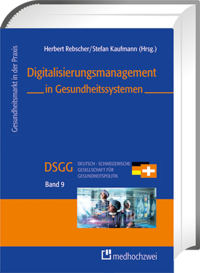 This book provides an impression of the new possibilities of networked data analysis and "Big Data" – for and within medical science and healthcare management. Big Data is about the collection, storage, search, distribution, statistical analysis and visualization of large amounts of data. This is especially relevant in healthcare management, as the amount of digital information is growing exponentially. An amount of data corresponding to 12 million novels emerges during the time of a single hospital stay. These are dimensions that cannot be dealt with without IT technologies. What can we do with the data that are available today? What will be possible in the next few years? Do we want everything that is possible? Who protects the data from wrong usage? More importantly, who protects the data from NOT being used? Big Data is the "resource of the 21st century" and might change the world of medical science more than we understand, realize and want at the moment. The core competence of Big Data will be the complete and correct collection, evaluation and interpretation of data. This also makes it possible to estimate the frame conditions and possibilities of the automation of daily (medical) routine. Can Big Data in medical science help to better understand fundamental problems of health and illness, and draw consequences accordingly? Big Data also means the overcoming of sector borders in healthcare management. The specialty of Big Data analysis will be the new quality of the outcomes of the combination of data that were not related before. That is why the editor of the book gives a voice to 30 experts, working in a variety of fields, such as in hospitals, in health insurance or as medical practitioners. The authors show potentials, risks, concrete practical examples, future scenarios, and come up with possible answers for the field of information technology and data privacy. The editor: Peter Langkafel (MD) MBA, General Manager for Public Sector and Healthcare at SAP AG, President of the Bundesverband Medizininformatiker (Federal Association of Medical Information Scientists – BVMI) for the Federal State of Berlin-Brandenburg and member of the Executive Board of the BITKOM (federal association of information industry, telecommunication and new media) study group "E-Health". Target group: executives in healthcare management, medical controlling, data protection commissioners, health care policy, health care law, health reporting, etc. Peter Langkafel (MD) MBA, General Manager for Public Sector and Healthcare at SAP AG, President of the Bundesverband Medizininformatiker (Federal Association of Medical Information Scientists – BVMI) for the Federal State of Berlin-Brandenburg and member of the Executive Board of the BITKOM (federal association of information industry, telecommunication and new media) study group "E-Health".